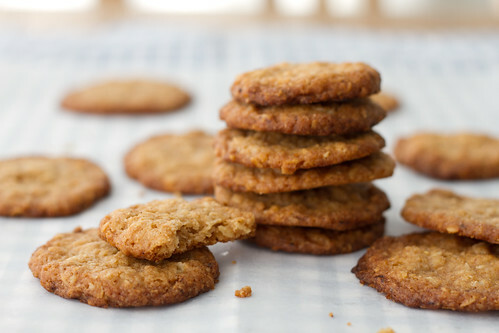 NAMI-NAMI: a food blog: Gingery oatcakes or oaty gingersnap cookies? You'll decide. 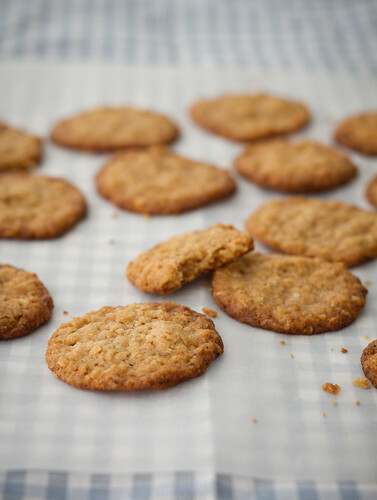 Gingery oatcakes or oaty gingersnap cookies? You'll decide. In theory, a batch of cookies spiked with ground ginger would be most suitable for Christmas, no? I guess so. Somehow, however, I've baked two batches of these simple gingery oatcakes/oaty gingersnap cookies during this week alone, and wouldn't mind baking them again soon. I blame the long and exhausting frosty winter we're having here in Estonia - temperatures have been falling below -10 Celsius again this week. Some delicious cookies help to forget (at least for a brief moment) that all you really-really want by now is some sun and spring and birdsong and, well, end of winter.. Note that these cookies do not contain any eggs, so they're perfect if you're cooking for someone who's allergic to eggs. Cream butter and sugar. Combine dry ingredients in a bowl, then stir into the sugar and butter mixture. Finally add the cream and stir lightly until combined. Form the cookie mixture into small balls (about a heaped teaspoonful each) and place them onto a parchment-covered baking sheet, leaving plenty of room between the cookies, as they spread out during baking. Bake in a preheated 200 C oven for about 8 minutes, until light golden brown on edges. Remove from the oven, leave to cool for a few minutes, then transfer onto a metal rack to dry and go crisp. both ginger and oatmeal help to keep you warm - did you notice? so it is not without reason you made these cookies just now. will try them too! thanks for posting! I've been looking for a ginger cookie recipe and this looks great - I'll let you know how I get on! Took out the ginger, substituted cinnamon and vanilla and used plant-based margarine and soy cream, and turned this into a delicious vegan cookie for some vegan friends. Thanks for the inspiration! Iris - that's a good point, I never thought of that!